AirPod Skins let you customize the look & color of your Apple AirPods, while protecting them from wear and everyday scratches. Made from premium adhesive vinyl that is easy to apply & remove your AirPod Skin let you get the most out of this amazing product. AirPod Skins let you customize the look & color of your Apple AirPods, while protecting them from wear and everyday scratches. Made from premium adhesive vinyl that is easy to apply and remove your AirPod Skin are made to last so you can get the most out of this amazing product. Our minimal Apple inspired design has been tested and endorsed by the top design publications and is being used by apple fans around the world. With 12 premium colors to chose from Airpodskin let you change the way you look and feel when wearing your AirPods. Make your AirPods black or for a more sober look or mix it up with one of our most popular colors red. It's really up to you! Don't have AirPods yet? Stay informed of upcoming products. Wholesale prices available. Please contact is by email and we will get back to you with information. Do you ship AirPod skins worldwide? Yes, we now ship AirPod skins worldwide except for China. We hope to include China as soon as possible. How hard are AirPod skins to apply precisely? The application is not hard but you must be gentle. Included in the package there are easy to follow instructions. The simple explanation is you start by aligning the top "U" of your AirPod skins, then align well with the body. See how to apply here. Will they still fit in the case? 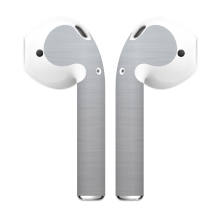 Will I feel AirPod skins in my ear at all? Our patented design is perfectly formed to avoid any ear irritation. You won't feel any difference. Are AirPod skins hard to remove? They are very easy to remove. You can peel them off at any time. 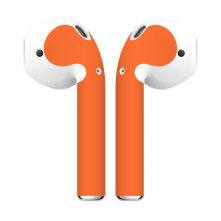 Are AirPod skins reusable after I remove them? The current model is not reusable but we are working with manufacturers to achieve a reusable version. We send you a second set in all orders for second use. Are my AirPods going to be dirty after I remove the AirPod skins? Once you remove your skins there will be NO residue from the adhesive at all. Our premium quality vinyl leaves no sticky feel behind.